The following movies illustrate the MD simulations reported in the article. The thumbnail images are linked to the movies in MPEG 1 format. 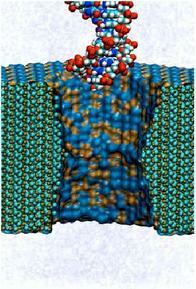 A short overview of the nanopore project can be found here. Movie 1. Translocation of single stranded DNA through a nanopore in Si3N4. 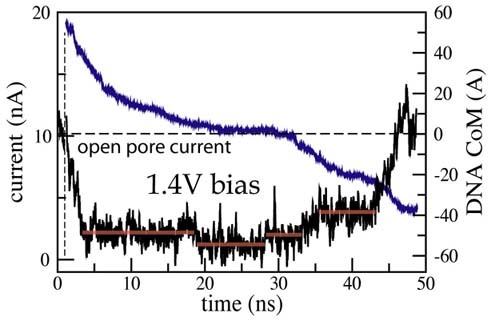 Simulation conditions: Electrical field of 1.3x109 V/m generates a voltage bias of 21 V across the membrane; 1.3±0.1 nm diameter pore; 5.2 nm thick membrane; single stranded (dC)20, 1M solution of KCl; 40125 atoms simulated; total simulation time is 1.3 ns; NvT ensemble. Movie 2. 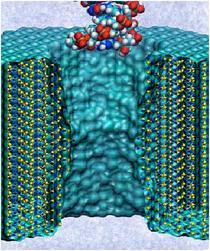 Translocation of double stranded DNA through a nanopore in Si3N4. 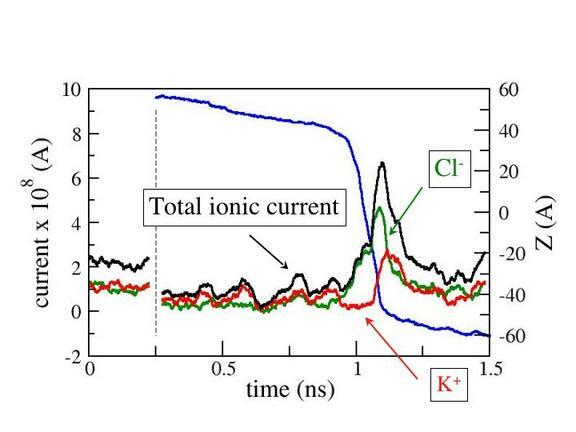 Simulation conditions: Electrical field 2.7x108 V/m corresponding to the voltage bias of 4.4 V; 2.4±0.2 nm diameter pore; 5.2nm thick membrane; double stranded (dC)20, 1M solution of KCl; 85207 atoms simulated; total simulation time is 3.7 ns; NvT ensemble. Movie 3. Slow electrophoresis of double stranded DNA through a nanopore in Si3N4. Simulation conditions: Electrical field 8.7x107 V/m corresponding to the voltage bias of 1.4 V; 2.4±0.2 nm diameter pore; 5.2nm thick membrane; double stranded (dC)20, 1M solution of KCl; 85207 atoms simulated; total simulation time is 49.5 ns; NvT ensemble. Movie 4. 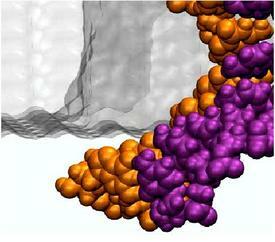 Spontaneous unzipping of the terminal DNA base pair inside a Si3N4 nanopore. Simulation conditions: Electrical field 8.7x106 V/m corresponding to the voltage bias of 0.14V; 2.4±0.2 nm diameter pore; 5.2nm thick membrane; double stranded (dC)20, 1M solution of KCl; 85207 atoms simulated; total simulation time is 26 ns; NvT ensemble. Movie 5. 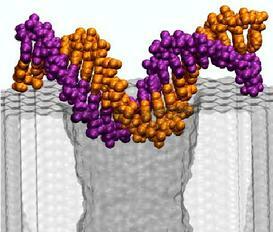 DNA it pulled sidewise inside the pore by an applied electrical field. Simulation conditions: Electrical field 8.7x107 V/m corresponding to the voltage bias of 1.4 V; 2.4±0.2 nm diameter pore; 5.2nm thick membrane; double stranded (dC)20, 1M solution of KCl; 85207 atoms simulated; total simulation time is 3 ns; NvT ensemble. Movie 6. 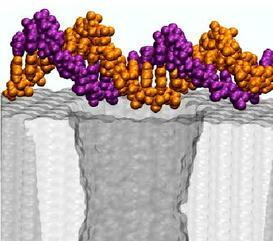 DNA it pulled sidewise inside the pore by a weak electrical field. 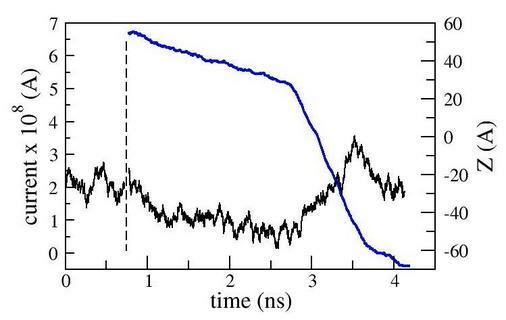 Simulation conditions: Electrical field 2.7x107 V/m corresponding to the voltage bias of 0.44 V; 2.4±0.2 nm diameter pore; 5.2 nm thick membrane; double stranded (dC)20, 1M solution of KCl; 85207 atoms simulated; total simulation time is 4 ns; NvT ensemble. Contact Us // Material on this page is copyrighted; contact Webmaster for more information. // Document last modified on 19 Jul 2006 // 13689 accesses since 20 Mar 2006 .